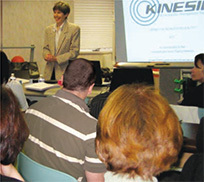 Kinesio Taping Seminars « Spine Solvers Inc. Become certified in the art and practice of Kinesio Taping. Check out the calendar of seminar dates below. Our mission is to provide pain management information, consultation, and skill building to health care professionals in the form of continuing education. Dr. Wolkenberg teaches the KINESIO TAPING METHOD to licensed physical and occupational therapists and assistants, massage therapists, chiropractors, athletic trainers, physicians, nurses, and other hands-on licensed medical professionals. KINESIO TAPING is a powerful modality with very few contraindications that can be used for pain reduction, edema control, myofascial release, scar management, tendon and ligament support, muscle re-balancing and re-education, and can extend the effects of your manual treatment well beyond what you achieve in the clinic. Click here for an INTERVIEW with Andrea Wolkenberg about Kinesio Taping. Click here for the Kinesio Taping Association. For information and registration, click on links provided. Addressing a Kinesio Taping class.